After Salman Khan's Race 3 & Aamir Khan's Thugs Of Hindostan Disappoint, All Eyes Are Now On Shah Rukh Khan's Zero! Home » Bollywood News » After Salman Khan’s Race 3 & Aamir Khan’s Thugs Of Hindostan Disappoint, All Eyes Are Now On Shah Rukh Khan’s Zero! With two of the three Khans failed in delivering a good content, fans now have high hopes from Shah Rukh Khan and his Zero. The year 2018 has turned out to be an exciting one for Bollywood, as many underdog movies have performed extremely well at the box office. But for the ardent fans of Salman Khan & Aamir Khan, the year is rather disappointing. Both Race 3 and Thugs Of Hindostan received mostly mixed to negative reactions from the audiences and critics. As both Khans failed to deliver the content, now all hopes are pinned on Shah Rukh Khan and his much-awaited Zero. 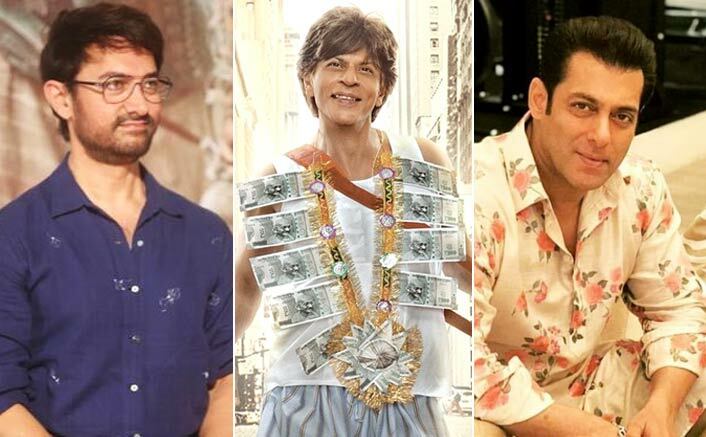 After spending almost three decades in the industry, the trio of Khans – Salman Khan, Shah Rukh Khan and Aamir Khan, enjoy a tremendous and loyal fan base, which is irreplaceable. Despite various lows in career, Khans followers kept on growing in numbers due to their love and sincere efforts of entertaining the audience. Salman Khan starrer Race 3, which released earlier this year, failed big time to amuse the masses. All thanks to the pre-release buzz and stardom of the superstar, the movie collected a decent total of 169 crores at the box office. Even though the movie fared averagely, it was considered a nightmare for the audiences. Right from misfit of the cast to flawed script, screenplay and direction, the movie got bashed in all departments. Even Salmaniacs couldn’t have expected such a movie from their beloved actor. Last year, Aamir Khan won the hearts with his last Diwali release Secret Superstar, but has failed to repeat the magic with his Thugs Of Hindostan. As legend Amitabh Bachchan was sharing screen space with Mr.Perfectionist for the first time, the hype was immense amongst the fans. Due to the festive season and buzz, the movie clocked the biggest opening in Bollywood but only managed for mixed to negative feedback coming its way. It failed to match the expectations of the audience and turned out as a below average movie. With two of the three Khans failed in delivering a good content, fans now have high hopes from Shah Rukh Khan and his Zero. The trailer which was released on star’s birthday received a highly positive response from both, critics and viewers. It is also touted as SRK’s comeback in the box office game, after the duds like Fan and Jab Harry Met Sejal. As the promo suggests Zero promises to be a family entertainer with chart buster music and it could be a breakthrough performance of the Superstar. Although the movie is all set to open huge, considering the buzz and the mind-blowing trailer, the audience will be expecting an entertaining offering from SRK!